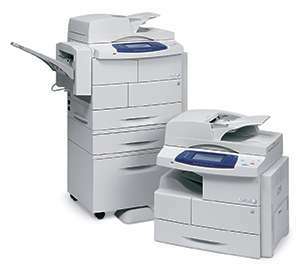 The Xerox WorkCentre 4260 combines ease of use and exceptional reliability with world-class copy, print colour scanning and fax capabilities. Ideal for a busy office environment thanks to its high productivity and small footprint it easily meets the needs of demanding user workflows. The feature rich Xerox WorkCentre 4260 is network ready straight out of the box, with easy to install software on all major operating systems. The intuitive touch screen uses easy to recognise icons to help users navigate around the Xerox WorkCentre 4260 capabilities. Users can print up to 55 pages per minute in black and white, has a usage counter for greater cost control and has built in colour scan capabilities. Scanning with the Xerox WorkCentre 4260 is simple, it gives users the ability to scan to email, scan PDFs to a network folder, copy scans to the built in hard drive and scan directly to a USB. Uers can quickly and easily make secure backups of their documents with built in security software.